We once discussed the idea of establishing a name and branding for the East End Grocery Store and now we have a name: The Market @ 25th. Presented at a packed meeting at the Peter Paul Development Center, the name of the store will reflect the rich history of Church Hill with its aisles and checkout lanes being named after Church Hill streets and local churches. In fact, Kristen Rabourdin, the store’s new Marketing Director is looking for two specific things from the community: picture of the community as it has grown over the years and local historians that can speak thoroughly about the different buildings in the area whose history has proven harder to find. If you’re interested in working with The Market on this project, let us know in the comments or email us at chpnrva@gmail.com and we’ll connect you directly with them. Also of note, all the departments in the store will be named after “past or present organizations whose family has been a significant part of Church Hill history”. One of the exciting announcements at the meeting was that Dr. Shantelle Brown will operate “Hope Pharmacy”. Remember Dr. Edloe’s Pharmacy?, well, Dr. Brown formerly worked at the now vacant space. Though recently she worked as a pharmacist at Sam’s Club in White Oak Village (which also closed recently). Learn more about Dr. Brown here. The Market is partnering with the Metropolitan Business League and the African American Chamber of Commerce to sell different types of products that could be sold in the store. This is another effort to work with small and local businesses and entrepreneurs in the area. Don’t forget about the upcoming Father’s Day Cookout job fair! The Market is planning on hiring about 100 full and part-time workers. If you were looking at ways in which this store has been conceived, from infancy dream stages to what it is now, you’ll note the impressive ways in which Norm Gold has managed to maintain a community conversation going since last year. It has been a constant discussion with community leaders, churches, business associations, town halls and through media outlets. If you haven’t had a chance to have your idea heard, there are still plenty of opportunities to give feedback. In addition, Norm has committed to doing a daily blog to keep people informed about the store. Though this whole concept and idea have been an incredible undertaking there is an issue that needs to be resolved: parking. 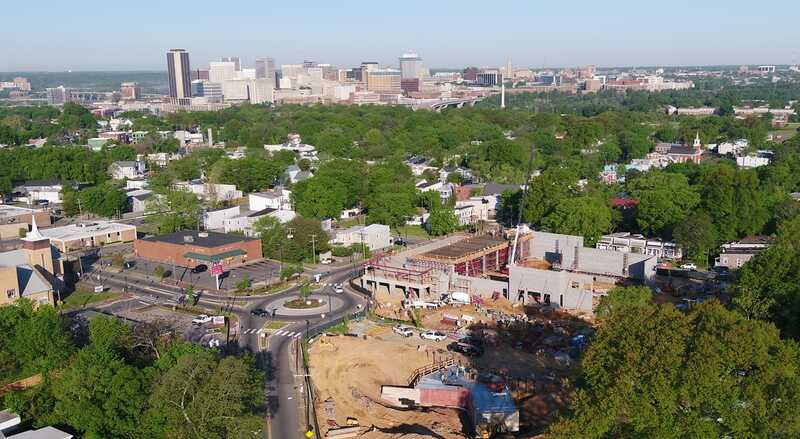 The Market will have about 80 parking spots that are shared with VCU Health, the J. Sargeant Reynolds Culinary School and the 42 apartments. We’ll cover this separately, but the culinary school is expecting 700 students to take classes when it opens in the fall of 2019. A question of parking was somewhat dismissed, but we all have to discuss the implications of what this will mean to everyone in the immediate vicinity and for the success of the store itself. Is a structured parking lot not a feasibility? I’ve been wondering about the parking… Luckily for me, The Market is only a couple blocks from my house, so a wheeled cart will work for carrying groceries home. WHAT on parking?? Is that for real? This is a huge deal for the people who live near this. Parking is really easy right now, but our neighborhood could become like the few blocks near VCU, impossible. I’m not worried about the market and the apartments, that’s not the issue, but the culinary school – 700 students?! The culinary school needs to deal with this, ASAP. Establish a remote parking lot and shuttle if need be, but that’s way too many people without essentially any parking for them. How on earth did the parking not cause an issue with zoning? Isn’t that what zoning is for??? This is a huge deal for the people who live nearby, I can’t believe it’s being dismissed as not a big deal. And before all the bus/walk/bike people chime in, our city is NOT there yet. I hope it gets there, that mass transit and bike lanes make those options possible, but right now, a lot/most people at the culinary school are probably going to drive. Just trying to be realistic. J Sarge mentioned at the meeting that they will have a circulator running between campuses. They also noted a capacity for 700 student enrollment which likely does not equal the regular and routine presence of 700 students. Re: a deck, who would pony up the $20k or so per space to build the deck and who would maintain and police a deck that would sit idle most of the day. I’m supportive of the city moving to reduce parking minimums for projects like this, infill in Manchester, and other new development around the city. Thanks HW – that’s true that 700 people wouldn’t be there all at once, so it would be a lot less at any given time. However, north Church Hill is almost entirely single home residential. In a district like this, I think it’s fair to expect that you’ll be able to rather easily park in front or very close to your house, without having to deal with overflow from commercial areas that did not include enough parking.